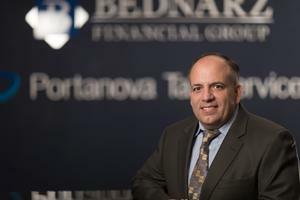 William D. Portanova Jr. became a Registered Representative, with Bednarz Financial Group, when he joined the firm in 2007. Bill possesses his Life, Accident and Health Insurance, and Series 7 and 63 securities licenses. At Bednarz Financial Group, Bill is responsible for maintaining client relationships, providing investment advice, and helping clients achieve synergy between their investments and taxes. In addition to being a Registered Representative, Bill is the owner of Portanova Financial Services, since 1995, which offers tax, accounting and payroll services. He services over 700 clients, which include individuals and businesses. Bill received his Bachelor of Science in Professional Accountancy from The Pennsylvania State University, where he was graduated with High Distinction. Bill has also attained the Registered Tax Return Preparer designation from the Internal Revenue Service. Bill is active in several civic and charitable organizations and is the Treasurer of the San Cataldo Society. He is also a volunteer coach with DGR Soccer, Dunmore Missy League Softball, Dunmore Biddy Basketball, and Dunmore Little League Baseball.